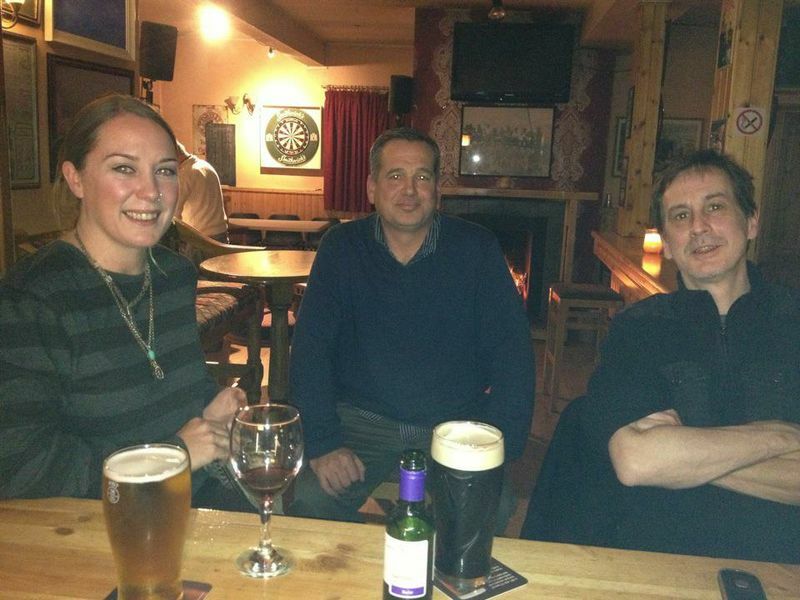 The Lost Tribe of Donegal – Rachel Fitzgerald, Chris Byrne and Andrew Harkin. Chris Byrne became a legend in the Irish American music scene in New York for always being one step ahead of the trend. Sensing the energy brought on by a new wave of Irish immigrants in the early nineties, he gave up his day gig as a New York City cop in the Times Square precinct to form Black '47 and assumed the role of chief rapper and pipe player. Ireland's 1994 advance to the World Cup inspired him to release the single "C'mon Ya Boyz n' Green" under the name Seanchaí. His teaming with Pat McGuire (of Spéir Mor) and acclaimed fiddle player Eileen Ivers formed Paddy-A-Go-Go, a legendary band whose album Keep it Reel is the most sought-after out-of-print disc on the island of Manhattan. With this reputation in mind, it was no surprise when the crowd of 900 quieted down during the recent Sandy Seisiuns benefit at Connolly’s to hear what Byrne had up his sleeve now. He was accompanied by former Prodigals bassist Andrew Harkin, who traded his bass for a Greek bouzouki, and Byrne’s wife, the Dublin singer Rachel Fitzgerald, and he captivated the rowdy crowd with an acoustic trad set. In an evening crammed with sizzling Celtic rock, the simple acoustic trad set punctuated by squeals from both the crowd and Byrne’s uilleann pipes threw us all for a right turn no one was expecting. That was the point of Byrne’s new project, Lost Tribe of Donegal. “ I’ve been playing in clubs for over 30 years now,” he explains during our chat over the weekend. “When I started out, Larry Kirwan and I would make this noise with a drum machine, guitar and pipes and it was so radical at the time. Now, everyone is on a Celtic rock bandwagon. the title track, his Irish brogue doing a jig with his New Yawk accent as he paints this urban picture. The tough prose is in stark contrast to the lush strings of Harkin’s bouzouki. On “Five Times Jackie,” a Seanchai staple, Byrne strips the reggae tune down to acoustic strumming without losing the Jamaican soul of the original. These songs are meant to be enjoyed in the snug of a pub, with a dark pint in hand, as you listen to this rich music. Byrne and Harkin have been playing a trad session a few nights a week for a few years at Rocky Sullivan’s of Red Hook, the pub that Byrne owns. “He and I came from the same area of Donegal,” Byrne explains. “The trad music up there is different. What makes their music distinctive, the sort of music they play has a Highlands vibe to it. Byrne jokes that Red Hook, the furthest outpost of Brooklyn, has a lot in common with the remote border county of their ancestry. During the Sandy Seisiuns benefit, Byrne and Fitzgerald shared with me the devastation their beloved Red Hook suffered. “We lost every piece of musical and restaurant equipment in the place with five feet of water in the bar,” he explains. “With help of family and friends we got this up and running. A lot of our regulars have left the area and our business is down by a high percentage. A lot of people have moved to adjoining neighborhoods for the time being. Byrne has been playing his Lost Tribes music on both sides of the Atlantic, with regular gigs around Brooklyn picking up steam and a successful theater tour of Ireland with old friend (and former Rocky Sullivan’s bartender) Damien Dempsey. “The last time I did a theater gig was my school Christmas pageant,” he says with a dry laugh. “All eyes were on our playing. “The reception in Ireland was really good. There is so much noise out there at the moment with all the electronics we all carry on us now that I think people like that earthy feel of the traditional vibe we have. If people get a sense you are real and sincere, they will pay attention. “A lot of the sincerity is questionable in rock right now and there is very little perception in trad music,” he continues. “We are mobile: makes no difference if there is a sound system or not. If you want to hear, come closer; if not, stay toward the back of the bar. Harkin, easily the best bass player walking around New York, has enjoyed a creative rebirth on his new instrument. Byrne is enjoying the experience of “locking in with one another” as their organic gigs blossom. “When we play a set of jigs and reels, it’s all instinct between us. Like being married, only better. Then you add Rachel’s great voice. She is our token member. Our token Dub,” Byrne says. Byrne credits the expert knob twiddling of legendary trad player Ivan Goff , who he says was a great teacher as a producer. Byrne’s acoustic turn has also been borne from necessity, as Rocky Sullivan’s lost its sound system in the storm. He hopes to have that restored by St. Patrick’s Day. To help the process, drop by the bar for a pint and pick up a copy of this fantastic CD. The more pints we drink, the sooner the electric City Ceol can resume! Log onto the Lost Tribe of Donegal Facebook page for more information.